Indian Bank Specialist Cadre 2019 Result with Marks Check Here. Indian Bank Specialist Cadre 2019 Interview Letter Check Here. Indian Bank Specialist Cadre 2018 Admit Card Check Here. Indian Bank Notification is out. Indian Bank is recruiting for 145 Specialist Cadre 2019 Posts. 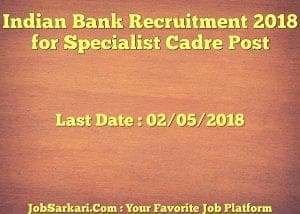 You can check Indian Bank - Indian Bank last date, download Indian Bank notification, visit Indian Bank official website and check other Indian Bank Vacancy details.Complete Vacancy and recruitment Details about 145 Specialist Cadre 2019 vacancies in Indian Bank are provided below by JobSarkari.Com only for you. Last Date for Apply Online 02/05/2018. 01. Assistant General Manager System Administration 30-45 Years. 01. 02. Chief Manager DBA, Oracle, My Sql, DB, Server 27-40 Years. 02. 03. Manager DBA, Oracle, My Sql, DB, Server 23-35 Years. 02. 04. Chief Manager SA AIX, HP-UX, Linux, Window 27-40 Years. 01. 05. Manager SA AIX, HP-UX, Linux, Window 23-35 Years. 02. 06. Senior Manager Middle Ware Administrative 25-38 Years. 02. 07. Chief Manager Application Architect 27-40 Years. 01. 08. Manager Application Architect 23-35 Years. 01. 09. Chief Manager Big Data Analytics 27-40 Years. 01. 10. Senior Manager Big Data Analytics 25-38 Years. 01. 11. Chief Manager IT Specialist 27-40 Years. 01. 12. Manager IT Specialist 23-35 Years. 02. 13. Chief Manager Software Testing Specialist 27-40 Years. 01. 14. Manager Software Testing Specialist 23-35 Years. 02. 15. Chief Manager Network Specialist 27-40 Years. 01. 16. Senior Manager Network Specialist 25-38 Years. 01. 17. Manager Virtualization specialist for VMware, Microsoft hypervisor, RHEL 23-35 Years. 02. 18. Senior Manager Project Architect 25-38 Years. 01. 19. Senior Manager Data Center Management 25-38 Years. 01. 20. Manager Network Administrator 23-35 Years. 02. 21. Chief Manager Cyber security specialist 27-40 Years. 01. 22. Senior Manager Cyber security specialist 25-38 Years. 02. 23. Senior Manager Senior Information Security Manager 25-38 Years. 01. 24. Manager Information Security Administrators 23-35 Years. 03. 25. Manager Cyber Forensic Analyst 23-35 Years. 01. 26. Manager Certified Ethical Hacker & Penetration Tester 23-35 Years. 01. 27. Assistant Manager Application Security Tester 20-30 Years. 01. 28. Senior Manager Regulatory Compliance 27-38 Years. 01. 29. Senior Manager Research Analyst 27-38 Years. 01. 30. Senior Manager Fixed Income Dealer 27-38 Years. 02. 31. Manager Equity Dealer 25-35 Years. 01. 32. Senior Manager Forex Derivative Dealer 27-38 Years. 01. 33. Senior Manager Forex Global Markets Dealer 27-38 Years. 01. 34. Manager Forex Dealer 25-35 Years. 01. 35. Senior Manager Relationship Manager Trade Finance and forex 27-38 Years. 03. 36. Senior Manager Business Research Analyst -Trade Finance and Forex 27-38 Years. 01. 37. Senior Manager Credit Analyst Corporates 25-38 Years. 01. 38. Senior Manager Risk Management 27-38 Years. 02. 39. Manager Risk Management 25-35 Years. 04. 40. Manager Security Officer 25-35 Years. 25. 41. Senior Manager Credit 25-38 Years. 20. 42. Manager Credit 23-35 Years. 30. 43. Manager Statistician 25-35 Years. 01. 44. Assistant Manager Statistician 22-30 Years. 01. 45. Manager Electrical 23-35 Years. 02. 46. Manager Civil 23-35 Years. 02. 47. Assistant Manager Civil 20-30 Years. 06. 48. Assistant Manager Architect 20-30 Years. 01. Total No. of Post 145. For Post Code 23,24,25,26,27 Candidate Having B.E/B.Tech Degree or Post Graduate in Computer Science/Computer Technology/Computer Science & Eng/Computer Eng/Computer Science& Tech/IT/Electronics & Communication. Graduate Diploma in Banking/Trade Finance/International Business. FOR Post Code 37 to 48 Please Check the Notification. 8. Online Application can be Submitted on or Before 02nd May 2018. Q. What is the Last Date For Indian Bank Specialist Cadre 2019 Vacancy ? A. Last Date for Indian Bank Specialist Cadre 2019 Posts is 02/05/2018. Q. 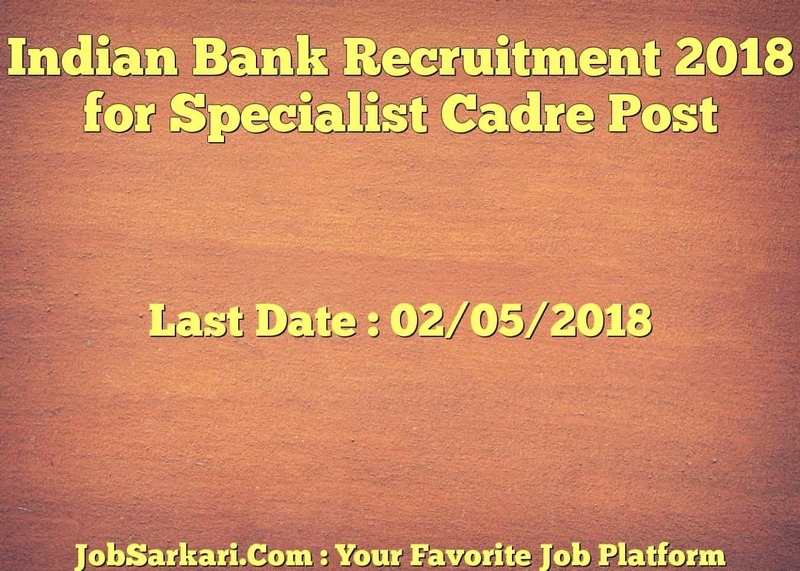 What is the Form Type of Indian Bank Specialist Cadre 2019 Recruitment ? A. The Form Type for Indian Bank Specialist Cadre 2019 Posts is Online. Q. How many vacancies are available in Indian Bank Specialist Cadre 2019 Posts ? A. There are about 100 Vacancies in Indian Bank Specialist Cadre 2019 Posts. Q. What is the Full Form of Indian Bank ? A. Full Form of Indian Bank is Indian Bank . I AM REALLY INTERESTED TO DO THIS JOB. hello, thanks for Showing Interest in this job how can we Help you Regarding Indian Bank Recruitment 2018 for Sports Person. Anyone can help me.actually I forgot to keep another copy of my application form of 145 vacancy specialist officer 2018. Now how I can take reprint of application form.plz help me. Its very urgent for me.plz plz.